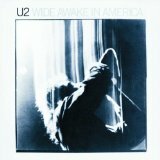 Wide Awake In America was the second 'mini LP' to be released by U2 (the first being Under A Blood Red Sky). It came out in May 1985 and contained only four songs, three of which had already been released on the b side of the The Unforgettable Fire single. The live version of Bad was the only one of the songs which had not been previously available. Both live songs were recorded during the North American tour of 1984-85 (although their videos were shot in Europe), while the studio songs were recorded in Slane Castle and Windmill Lane studios in Dublin. Initially, this record was only released in the USA, and could only be bought as an import in the UK. Despite its limited availability in Britain, it still entered the album charts, before it was eventually put on general release on CD only, a couple of years after its first release. It has always been classed as an album, although in length it is similar to an old fashioned 12 inch EP (Extended Player), or a CD single. I can remember spending many hours hunting the record shops of Belfast for this record, back in the days before I owned a CD player. In the end I had to get it brought from England! 'Wide Awake' marked the first time that the band had produced some songs themselves. Bad and Love Comes Tumbling were both produced solely by U2, while Brian Eno and Daniel Lanois assisted them with Three Sunrises. Only A Sort Of Homecoming had no input from the band, being produced instead by the legendary Tony Visconti. Since it's only a short album, I can't think of anything else to say on the subject. I could mention the fact that I had a huge Wide Awake In America poster on the wall of my room all through university but you're not interested in that.